Here is our new Murray McMurray Logo magnet. It is laser cut Mille Fleur logo on cherry wood. Is 2 1/4" round. Makes a fun gift or get some for your own fridge! Picture of magnet shown on Tin Bucket (not included) catalog number 1CBM. 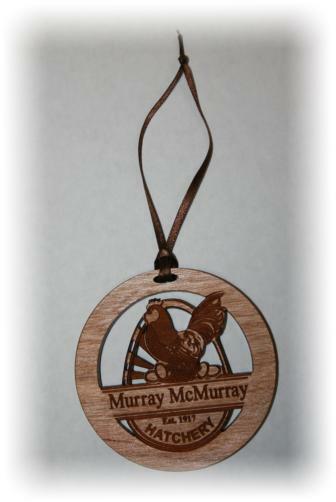 Our first time ever McMurray Hatchery logo hanging ornament. It is 3 inch round lazer on cherry wood and will hang with a lovely brown ribbon included. A great addition to any ornament collection. This night light is beautifully done as the other night lights that we sell. Done in cherry with the Murray McMurray Mille Fleur logo. 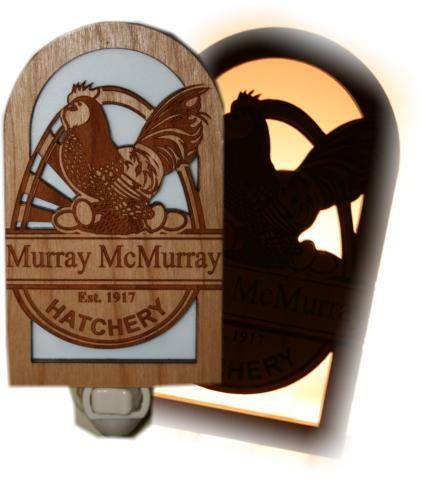 The chicken lover or hatchery items collector will love this night light. Get one for yourself, and for gifts for other chicken fanciers. Picture shows night light in day and night time.